PreMinder is an easy-to-use yet highly customisable calendar app for Mac OS X. Some of the key features are listed below, followed by a guide on how to sync PreMinder with iCal/Calendar and other devices. Flexible Views. See your information the way you want to: with weekly, monthly, two-monthly, yearly or multi-week views in the Calendar window. Here, events can be moved between different dates. The Day View window below the Calendar lets you edit notes and events quickly and see an at-a-glance schedule. With both the Calendar and Day View windows open, you can get an overview of a week or month and what's happening on one day at the same time. The two windows can resize dynamically together as if they were one, letting you see more of one quickly. Choose custom colours for the Calendar background, with different weekend colours if required. Click and Type. Don't fiddle around with lots of controls when you need to create an event quickly. Just click on the day you want to add something to, and start typing in the large central field in the Reminders window. Times are automatically recognised as you type. To change some text to a more formal event, select it and click an add button; you can then make the event repeat or have an alarm. Style Your Reminders. Notes for one day can contain text in different fonts, colours and sizes. They can also contain small images, useful for building up a diary or highlighting key information. If you need a certain piece of information to become a more formal event which can repeat or have an alarm, it can still have its own font, colour and style to differentiate it. You can also set a default text font and size for new events, or apply a font, font size and text colour to all events in a calendar. Fast Time Travel. Jump to any point in time quickly with buttons that let you glide between months or years. Use the unique scrolling slider at the top of the Calendar to go to any month of the year, and push the slider to the edge to scroll into the next year. Get back to today by clicking on the Target button. Scrub through a year's Reminders using the slider in the Reminders Window. Calendar Sync. Import calendars from Calendar (Formerly known as iCal). Link PreMinder calendars to system calendars so that when you edit or add events in PreMinder they are updated in Calendar and on devices set to sync with it such as iPhones. Sync changes made to linked calendars with PreMinder easily– iCloud calendars are supported. Repeating Events. Define events that repeat over a period of time or indefinitely. Full controls are provided for custom repeating events. Make events that repeat on the last Monday of each month, or once a week, every three days... there are a full range of possibilities. Spans. Create multi-day banner events via simple drag and drop. They can be easily resized by dragging their left or right edges or moved around in the Calendar window. Powerful Alarms. Any event can have an alarm attached to it which can either display a message (Growl is supported) or launch an application or open a file, or send an email to one or more people. You can specify a sound to be played when the alarm triggers. You can set when an alarm is triggered precisely, and even set it to 'pester' you-- go off several times over a specified period so you can't miss it! Scrolling View. The months of the year scrollbar lets you move between months easily, and show the end of one month and the start of another in your month view. Plus, it's live, so you can scan through a year's events quickly. The helpful month indicators in the scrollbar show you where you are and where to scroll to. Import Birthdays. Always forgetting people's birthdays? Import birthdays stored in the system Contacts address book directly into PreMinder, then set an alarm for them. PreMinder can even calculate people's ages for you, so you don't miss an important birthday. Choose ‘File > Import iCal Calendar…’ from the menu bar. In the ‘Import iCal Calendar’ dialog box, select the calendar you want to import from the popup menu. If you just want to import this calendar’s events into PreMinder but not keep them updated using PreMinder then uncheck the ‘Link iCal calendar with PreMinder Calendar’ checkbox. If you do want to keep the iCal and PreMinder calendars linked, then check the ‘Link iCal calendar with PreMinder Calendar’ checkbox. 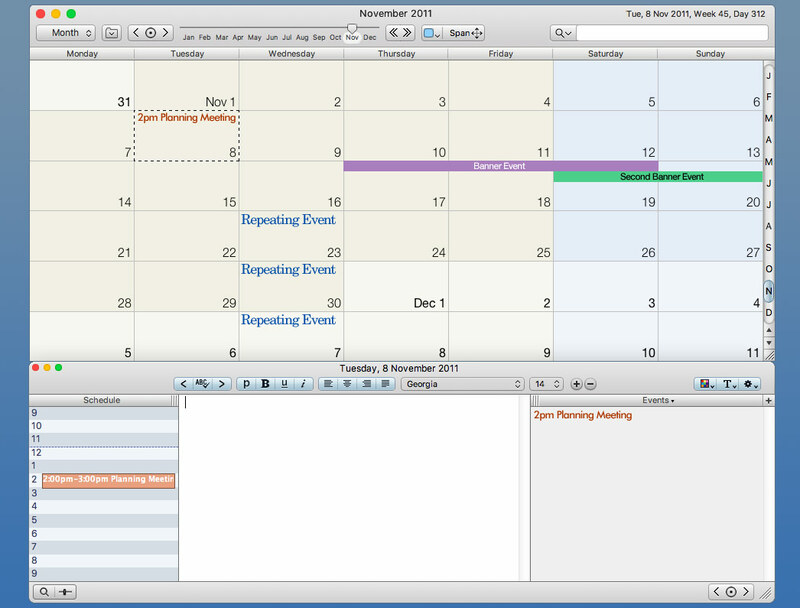 When you create an event in this calendar in PreMinder, it will automatically be created in the iCal calendar as well. When you update the event in PreMinder, the event is immediately updated in iCal. If the iCal calendar is synchronised with another device such as an iPhone, or a service such as Google Calendar or MobileMe, the event on the device or service will be updated when your Mac next performs a sync. Please note that with OS X 10.7.5 and below you need to launch iCal to update events with the cloud. If you keep iCal open in the background it should do this automatically. With OS X 10.8 and above, you do not need to have the Calendar application (iCal has been renamed to Calendar in OS X 10.8 and above) open to sync automatically with the cloud. When you trash an event in PreMinder, the linked iCal event is deleted. If you make a change to an event in a linked calendar outside of PreMinder, either in iCal, on another device or service, the change will not appear in PreMinder until you have synchronised your linked calendars. To do this you need to choose the menu option: ‘File > Sync with Linked iCal Calendars’ (Command ‘=’). Events deleted in iCal are moved to the trash in PreMinder. Please note that if you make a change to a repeating event in PreMinder linked to iCal, the change will apply to ALL instances of the repeating event in iCal. This is to simplify and speed up editing. You may not want to link PreMinder to an iCal calendar in which different instances of one repeating event contain different information. You may not want to link to an iCal calendar containing a repeating event with different alarms on different instances of the event, as editing the alarms in PreMinder will apply the same alarms to all instances of that repeating event. In the ‘Import iCal Calendar’ dialog box, the final option is a popup menu that allows you to choose the default colour for your calendar. This is automatically set to the closest match for the calendar’s assigned colour in iCal, but you can choose a different colour if you want. To begin the import process, click ‘OK’. If you have chosen to link the calendar to iCal, any events created in PreMinder in this calendar will automatically be added to iCal from now on. To import another iCal calendar, simply choose ‘File > Import iCal Calendar…’ from the menu bar again and select a different calendar to import from the popup menu. Events in a calendar that is not linked to iCal can have an alarm handled by PreMinder. Events in a calendar that is linked to iCal can have a PreMinder alarm and multiple iCal alarms. iCal alarms are handled by iCal's helper application which runs in the background. They will also sync with other devices if the iCal calendar they are part of is set to sync with these devices. Alarms can be set in the Day View window. Click on an event in the events list on the right hand side of the window and use the Alarm popup menu which appears near the bottom to set or edit alarms. PreMinder needs to be running to trigger PreMinder alarms. To keep it running unobtrusively in the background you can set it to hide all its windows when it is in the background by choosing ‘View > Hide All Windows when in Background’ from the menu bar. If an event has been deleted outside of PreMinder in a linked calendar, the next time the calendar is synced with PreMinder via ‘File > Sync with Linked iCal Calendars’, PreMinder will move that event to the trash. You can see events in the trash by choosing ‘File > Find…’ from the menu bar. In the Find window, make sure the popup menu in the top left is set to ‘Events and Spans’. Then, near the bottom right, check the checkbox marked ‘Show Items in Trash’. All events in the trash will be listed. You can filter these events by text, date, month, year and calendar using the controls above. Click on an event listed in the trash and you will be given the option to restore it. If you want to permanently delete all events in the trash click on the ‘Empty Trash’ button. IMPORTANT: PreMinder does not support Unicode alphabets. If you import events from iCal in a language that needs an extended character set, such as Japanese, the text will not be readable and will contain ‘?’ characters. For the foreseeable future Unicode cannot be supported, please accept my apologies for this. Exceptions in repeating events: an event might repeat every week but there could be one week where it appears on a different date. PreMinder will sync repeat exceptions with iCal for events that last less than a day. Multi-day events (spans) do not currently support repeat exceptions. There is a limit of four years on the scope of events imported from iCal. Any events that ended two years before the current date or start two years after the current date will not be imported. iCal import requires Mac OS 10.5 or higher. When you have completed these steps and Calendar is linked to Google, launch PreMinder. Choose ‘File > Import iCal Calendar…’ from the menu bar. Then select the name of the Google calendar from the popup menu– normally this will be your name. Requires Mac OS 10.4 or higher, Mac OS 10.5 or higher for iCal/Calendar sync. PreMinder is shareware, and can be tried for free for 40 non-consecutive days. After this a license key must be purchased to unlock it. A single user license is £18 GBP (Around $23 USD). Please allow up to 48 hours to receive your license key.